The search for new magnetic materials has pushed the fabrication and study of magnetic nanostructures, in particular nanoparticles, with controllable and improved magnetic properties that will allow the development of novel and promising technologies. Magnetic nanoparticles can be applied in different fields as data storage, permanent magnets, optics, catalysis and advanced thermoelectrics. Advanced synthesis methods are now available to produce magnetic nanoparticles with controlled size, size distribution, shape, and (hetero)structure. Hysteresis loops of core-shell magnetic nanoparticles (left; red: Ni cores; green: Ni@NiO core-shell, black: Ni@CoO core-shell nanoparticles). The stabilizing exchange coupling at the FM-AFM interface is clearly visible as loop shift (exchange bias). False-color SEM image of a thin film of core-shell nanoparticles and a pictorial sketch of a single nanoparticle (courtesy of prof. S. D’Addato, Università di Modena e Reggio Emilia). 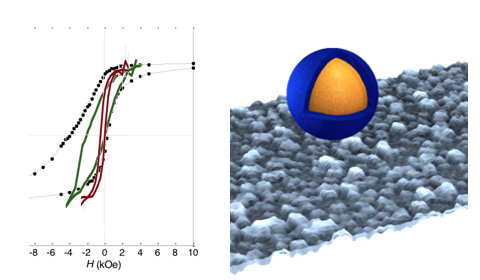 At CNR-ISTM in Milano, the goal of room temperature magnetic stability of nanoparticles is pursued, often in collaboration with other groups. Stabilization strategies are based on shape, composition, and exchange coupling (e.g. FM-AFM core-shell structure). Of course, magnetometry has a central role in the performance evaluation and understanding of structure-property relationships since it provides information about the magnetic behavior as a function of field, temperature, and time. More complex experiments and advanced data analysis techniques provide deeper insight into the magnetic materials. In the CNR laboratory of Rome, a new ferrofluid for thermoelectric applications is being developed within the consortium MAGENTA (FET-proactive H2020). In the CNR laboratory of Parma, the magnetic properties of nanoparticles to develop permanent magnets are investigated in the framework of the EU-H2020 Amphibian project. Transmission Electron Microscope (TEM) image of functionalized iron oxides nano-particles for disease detection and treatment. The magnetometry plateform at Unviversité de Lorraine hosts 7 magnetometers very well suited to characterize magnetic features of powders. Current collaborations include academics and companies, in the field of metallurgy (metal powder), physics (superconducting powder), health sciences (functionalized nanoparticles for disease detection and treatment), geology (functionalized nanoparticles for pollution detection).